Many women find that it is not always easy to consume all of the proper foods and supplements to ensure adequate nutrition during pregnancy, but those doing it on a vegan diet have an added challenge. A vegan diet can be a very healthy and nutritionally complete diet if done the right way, but excluding all meat and dairy foods can put women at risk of some key nutrient deficiencies, if not done properly. Protein may be the least of a vegan’s concerns as grains paired with beans provide a complete source of protein. The best part is that these two food groups don’t have to be eaten together at the same meal to be converted into a high quality protein. If a woman is consuming a variety of grains throughout the day such as rice, bread, and pasta, along with beans and legumes such as chick peas, lentils, and nuts, her body will be able to mix the nutrients together to create a complete protein regardless of when the foods were consumed. There are also certain “super foods” such as soy products and quinoa that can be broken down into all of the essential amino acids to provide a complete source of protein on their own. A nutrient that is more challenging to obtain when following a vegan diet is vitamin B12. This important B vitamin is needed in higher amounts before and in the beginning of pregnancy to ensure adequate development of the baby’s nervous system. Vitamin B12 is found mostly in meat and dairy foods which a vegan excludes from their diet. To obtain enough of this essential B vitamin, women must consume fortified breads and breakfast cereals. Taking an additional supplement is also recommended to ensure adequate intake. Calcium, needed to promote healthy bone development and growth, is another nutrient that a vegan’s diet may easily lack. Calcium is found mainly in dairy foods, but vegan sources include dark green leafy vegetables such as broccoli, collard greens, and kale. Fortified dairy alternatives such as soy, rice, or almond milk can also provide a good source of this bone-building nutrient. Vitamin D, which is needed to absorb calcium in the body, is also usually added to these beverages. Be sure to read the label to look at how much a beverage provides. An additional calcium plus vitamin D supplement should be taken as well to ensure adequate intake of these important nutrients. Another nutrient that a vegan’s may be lacking is iron, a mineral that is needed to create hemoglobin- the protein found in red blood cells which helps deliver oxygen to other cells and tissues throughout the body. Vegans can obtain this important nutrient through foods such as dried beans, dark green leafy vegetables, and fortified grains and dairy substitutes. Adding vitamin C to dark green vegetables helps the body absorb more iron from them. Vitamin C-rich foods include citrus fruits, tomatoes, and strawberries, so adding a citrus dressing to spinach or eating tomatoes with broccoli, for example, could be a great way to boost a vegan’s iron intake. 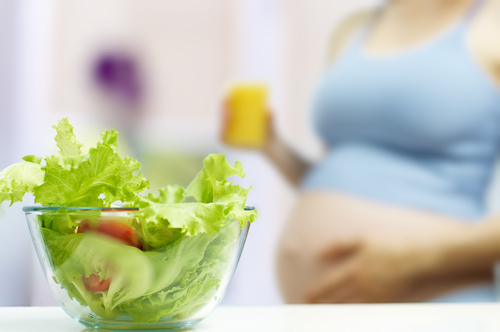 Taking a prenatal vitamin along with eating iron-rich foods will ensure that a pregnant women’s iron needs are met. One of the most challenging nutrients for a vegan to obtain is Omega-3 fatty acids which are important unsaturated fats that help promote cognitive development and healthy cardiovascular function in developing infants. These healthy fats are found mostly in fatty fish such as salmon, bass, and mackerel- foods that a vegan cannot eat. Unfortunately, the plant sources of omega- 3 fatty acids such as flaxseeds, soybeans, pumpkin seeds, and walnuts, do not contain the same type of omega-3 found in fish and have not been shown to confer the same health benefits. It is therefore recommended that vegans consume an omega-3 supplement to obtain these critical fats. Though vegans have more to consider when it comes to obtaining proper nutrition to promote a healthy pregnancy, the job can certainly be done with a little meal planning, nutrient supplementation, and guidance from a registered dietitian!